This is how we keep everyone happy at meal times. 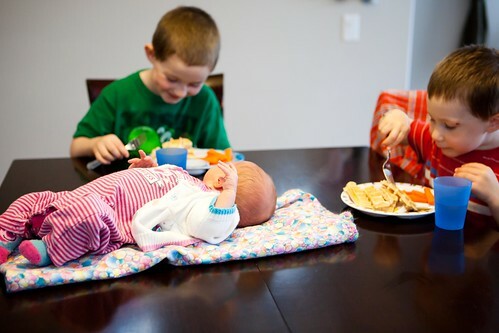 Nothing like a baby for a centerpiece. I am so, so tired. The hardest thing about a newborn is having a 3 year old. Oh, and non stop rain. Oh, and a baby that doesn't want to be put down between 6-11pm. Momma Bear needs a nap or maybe just a husband that can breastfeed. Fussy babies in the evenings...I remember that well. The 3rd week was always the hardest for me - the tiredness catches up with you by then. Here's hoping some good weather is coming your way. oh love the outfit! that was samis fav! I'd marry a man who could breastfeed. Even if they could only BF for the first few weeks...that'd be awesome!! !